We asked two of the current students of the MA in Children’s Literature, Judith Digby and Katharina Schaefers, to write about their experiences from the Travels in Children’s Literature module taught by Dr Alison Waller in Spring 2015. To find out more about Travels in Children’s Literature or the MA/PGDip programme, read Judith and Katharina’s reviews below and consider attending the NCRCL Open Day or Virtual Open Day 2015. The NCRCL is offering two Children’s Literature MA bursaries of £1,500 each (one for the on-site programme and one for the distance learners). 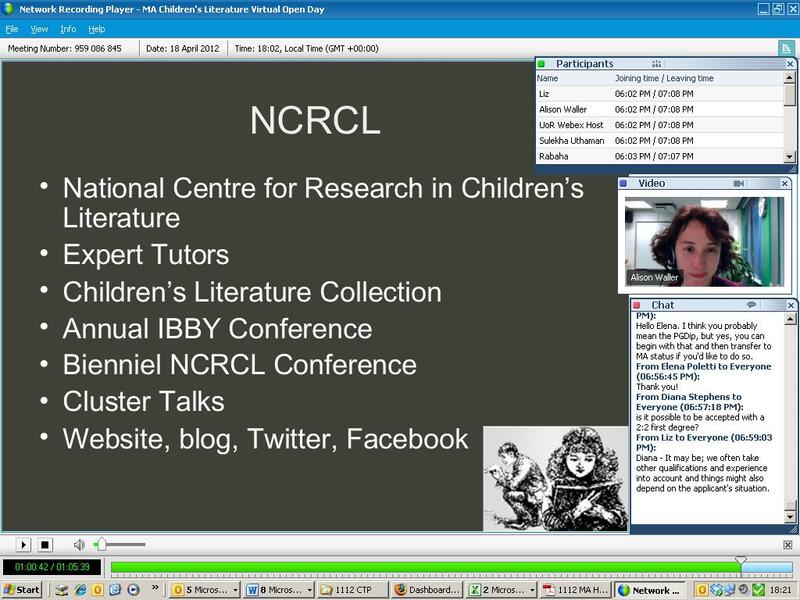 We recently held another Virtual Open Day for the MA in Children’s Literature by distance learning here at the NCRCL. Individuals from across the UK, Europe and from as far as China and Pakistan joined Liz Thiel and I for a fun event to learn more about the programme and the NCRCL. 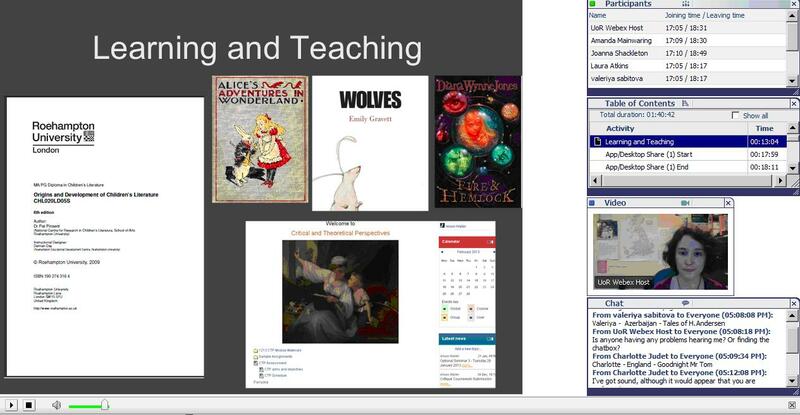 We introduced everyone to the team and showed off some of our excellent online children’s literature resources. Liz also had fun giving a mini-tutorial on Mary Sherwood’s The History of the Fairchild Family. More details about the distance learning MA and PGDip, including the application process and fees, can be found on the Virtual Open Day website. You are invited to participate in Roehampton’s MA/PGDip Children’s Literature by Distance Learning virtual open day on Wednesday 18 April 2012 at 18.00GMT. This event will provide you with an overview of the course and give you the chance to tour our online learning environment. To book your place on the virtual open day, please email Miles Shackleton at miles.shackleton@roehampton.ac.uk, providing your full name, country of residence, and date of birth.